Find your next big rehab project here. We specialize in locating great rehab properties and making them available to our cash buyers list at deeply discounted prices. Get your hands on them before they ever go on the market! We've made finding your next rehab project easy and our responsibility! Simply join our "VIP Buyers List" below to be one of the first to receive text and/or email notifications of our discounted rehab and cash flow properties. Enter your info below to get started! Or, text the word HOTDEALS to 817-993-9930 NOW for fastest notification of our deals via text or voice message! Get access to the best deals before your competition - you'll be the first to know when we get new properties. Get started to your right! 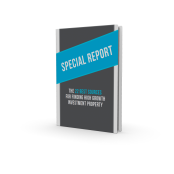 Get your FREE copy that reveals: "The 22 Best Sources for Finding High Growth Investment Property"
Receive Our DISCOUNTED Rehab & cashflow Inventory & Get Your FREE Report Today! Complete the form below to be the first to receive rehab deals in your area and get immediate access to our new report, "Special Report: The 22 Best Sources for Finding High Growth Investment Property." We specialize in locating, buying, and selling discounted and distressed houses and make them available to our Buyers List. To learn more, please call our free recorded info-line 24/7 at ​(817) 550-5069 Opt# 8. You may also text the word HOTDEALS to 817-993-9930 NOW for fastest notification of our deals via text or voice message! Are you looking for the best Investor Resources? Check out these valuable Investor Resources we' ve put together for you. TMC Property Solutions is an accredited business and A+ rated members of the Fort Worth BBB. Wait! Don't Forget Your Free Copy of Our Most Popular Ebook! We'd hate for you to leave empty handed. Fill out the short form below and we'll give you instant access to our most popular report. Insider Deals - A Guide to Finding Real Estate Deals Before They Hit The Open Market. Talk soon! To learn more, call our 24 hr free recorded info line at (817) 550-5069 Opt# 8 NOW!